The thrill of going on vacation has everything to do with the anticipation of new surroundings, different cultures and great memories, and almost nothing to do with the actual preparation. However, since we can’t pack light and blow all of our savings on a spontaneous trip across the world (not yet anyway), there needs to be some room for practicality—I know, I know, not first on your list of vacation excitement, but it will make for a much better trip! So, before you set off to sandy beaches, historic cities, aging ruins and bustling metropolises, there are just a few Ps to remember. Whenever possible, pack light. Pack as though you will be living a nomadic lifestyle for the rest of your life, even if you won’t. There is nothing worse than lugging an overstuffed suitcase through Grecian streets and over Roman cobblestones, knowing that you don’t need half of what’s in there. Besides a major hernia, you risk having to resort to stuffing your souvenirs in the pockets of your jeans. Before throwing in thatfifth pair of shoes, “just in case,” make sure your essentials are there and make a list—one that includes a camera, toiletries, pajamas and undergarments, as well as an adaptor, if necessary. Do not, under any circumstance, try to get it all done right before you leave. Be prepared in case your alarm doesn’t go off, your ride is late, etc. Always aim to be early. Airports usually recommend being there two hours in advance. Confirm with your airline that flights are on time. If your journey takes you from airport to airport before your final destination, prepare your carry-on with an extra set of clothing and currency for each country. 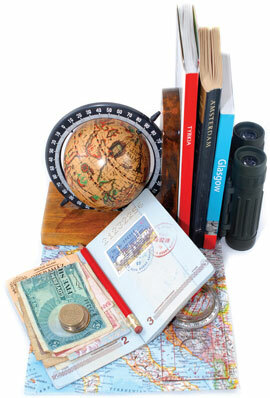 passports and other important documents on hand wherever you go. Visas, passports, citizenship papers, green cards…the documents are endless. The most frustrating part can be figuring out what you need and what the difference is. Making sure everything is up to date is important if you want to avoid an awkward conversation at the check-in counter. Also be sure to leave information about your traveller’s insurance, flight times, itineraries and hotel numbers for everyone back home. For a great checklist, visit http://www.snowbirds.org/html/checklist4.html. Malaria: caused by female anopholine mosquito bites. Hepatitis A: most common in developing countries (particularly in Africa, South America and Asia) and contracted through poor hygiene and contaminated drinking water. Traveller’s diarrhea: contracted through contaminated food and water, the culprit usually being E coli. It is estimated that 50 of travellers to developing countries will suffer from traveller’s diarrhea. Going continental may not be the greatest culture shock, but if you’re jetting off to an entirely different continent and culture, take the time to research. Learn about the customs (for example, cathedrals in Italy will not admit you if you’re wearing shorts or you have bare shoulders), figure out if you’ll be at your destination during any important holidays and research foods you may want to try.